Seek enlightenment and direction through the ancient Dreamtime. Aboriginal dreaming totems have been used for thousands of years as a way of seeking advice. The use of totems is not fortune-telling in the sense that you actually see the future. Instead, the dreaming totems provide you with a means of analyzing questions and seeking answers about a likely outcome. The future is not fixed, and you have the power to change it as you see fit. If you do not like the prediction given by the Aboriginal Dreaming Totems, then you can choose an alternative dreaming path. 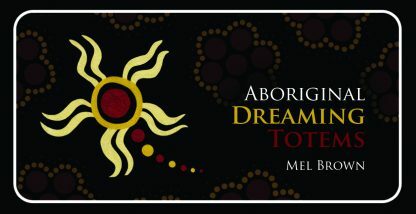 Mel Brown is a professional speaker, author, and artist who holds a masters in Indigenous Healing and Trauma from the Southern Cross University. She is also a counselor, and she regularly facilitates healing circles for women and youth, providing supervision to aboriginal and non-aboriginal workers within the health and welfare fields. Recognized for her work in service provisions for aboriginal families, she was awarded the ACT Public Service Award for the Most Improved Services to Aboriginal Children and Families in the ACT. Mel�s three card oracles�Aboriginal Dreamtime Oracle, Aboriginal Goddess Chakra Oracle, and Aboriginal Spirit Oracle�are bestselling decks.